Get an overview of how Balancing Act works. Enter basic information about your investments and rebalance your portfolio like an expert. What to buy? What to sell? Rebalancing requires selling investments that you have too much of and buying those for which you have too little. A large imbalance may exist for your initial rebalance. This is natural since you will be doing quite a bit of financial housecleaning. The imbalance will be smaller after completing the initial rebalancing, since a portfolio will tend to slowly drift away from its asset class targets. The steps to rebalance are the same, but it's emotionally harder with a large imbalance. Traditional pie chart for a portfolio with 70% stocks and 30% bonds. A pie chart is the usual way to visualize data that adds up to 100 percent, such as a portfolio asset allocation. Consider a simple example, a 70/30 portfolio comprised of 70 percent stocks and 30 percent bonds. Suppose that the target is actually 60/40. To represent the 60/40 target the chart has to be modified to show this extra information. That can be done in various ways by adding extra text, graphical elements and/or colors. The result can be effective if there are just a few pie slices and if they are all similar size. The fancy pie chart gets messy and confusing when these conditions are not met. Seesaw chart for a portfolio with 70% stocks and 30% bonds. Overall imbalance is indicated by the "balance beam" tilt. An innovative "seesaw chart" is being introduced with BalancingAct. The objective is to provide an at-a-glance overview of the portfolio including relative sizes of each asset class and how far each asset class is away from its target. It also gives an indication of the overall portfolio imbalance. The size (area) of each disk indicates the percentage of the corresponding asset class. Disks are positioned to the right of the triangle tip when the percentage is greater than the asset class target value and to the left when less than. Here the 70% stock (magenta) asset class is greater than the corresponding 60% target, for example. A disk would sit exactly on the tip of the triangle if the asset class is exactly on target. The balance beam is tilted depending on the amount of overall portfolio imbalance. Imagine that the portfolio starts with $20,000 in an S&P 500 index fund (e.g., IVV) and $8,400 in a corporate bond fund (e.g., LQD), approximately 70/30. The target is 60/40. The first seesaw chart shows this initial condition, with an imbalance of about 30%. If you sell $1,000 IVV and buy $1,000 LQD the imbalance will be about 20% as in the second chart. Note how the disks each move toward the triangle tip. If the trade is $2,000 the imbalance will be about 10% as in the third chart. The fourth chart is nearly balanced at about 0.4% imbalance, corresponding to trading $3,000. Perfect balance requires trading $2,960. This example is as simple as possible and it's child's play to rebalance. Most rebalancing explanations do not go into any more depth, leaving the reader with this illusion of simplicity. Let's add a bit of real-world realism by assuming that the account is taxable with 15% capital gains rate. Also assume that trades cost $9 each. Trading $2,650 will reduce the imbalance from 30% to 3% with fees of $18 ($9 to sell IVV and $9 to buy LQD). Imagine that the IVV cost basis is $17,000 corresponding to an 18% gain. The $2,650 sale of IVV will incur a tax liability of $58, making the overall rebalance cost $76. Perfect balance requires trading $2,960 which will increase tax liability to $65. Taxes and fees do not change the basic rebalancing, but they do introduce factors that must be considered. Next we consider a portfolio with five asset classes. 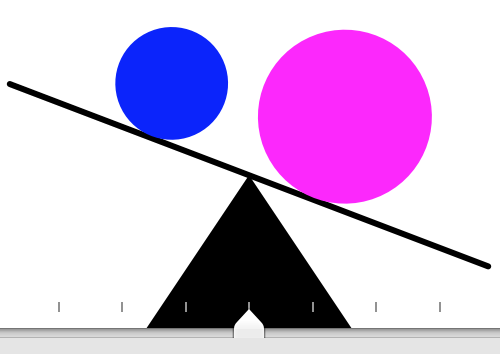 The seesaw charts show a progression from 51% imbalance to 6% imbalance to perfectly balanced. Rebalancing from 51% to 6% costs $36 in fees and $76 in taxes. The cost to reach perfect balance is $45 in fees and $86 in taxes. The investments (all exchange traded funds) in the account are detailed below. This includes results of rebalancing calculations for the 6% case. Notice that there is no trade or fee for IVV, because the Large Cap asset class is already close to target. Balancing Act avoids making trades that don't reduce imbalance very much. The Trade column contains "answers" -- What to buy? What to sell? (negative values mean sell). Trading fees are also shown. A separate table shows the asset class targets and the corresponding plan and actual percentages. The plan column shows percentages if trades are executed. 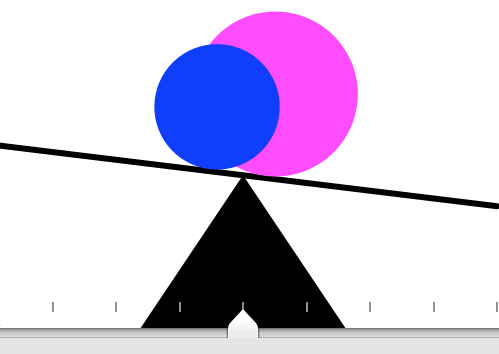 The screen shot for the example with perfect balancing appears below. This includes the Rebalancing Costs table (Fee + Tax + Spread). This example with five asset classes is fairly realistic. It starts out with an unusually high imbalance, about 50%. You would normally rebalance when the imbalance exceeds 10 to 20 percent. It's not necessary and often not cost-effective to restore perfect balance. There will always be a tradeoff between residual imbalance and rebalancing cost. The decision process is greatly simplified because BalancingAct takes care of all the detailed calculations. As a final example, we include a second account in the portfolio. It will be an IRA, hence not subject to capital gains tax. Otherwise it's identical to the first one. You could rebalance each account independently. The trades for the original taxable account will be the same as the previous example. Trades for the IRA account, if done separately will be the same, costing $45 in transaction fees but no taxes. The total portfolio rebalancing cost is $177. But there is another way. Perform the rebalancing for the overall portfolio. Total portfolio rebalancing cost is only $47, a savings of $130. That's a pretty remarkable outcome, made possible by the optimization engine in BalancingAct. The screenshot below displays the results, with the overall portfolio selected. There are duplicate rows in the bottom table because each account holds identical investments. Look at the Trade column. The blank entries are for the taxable account. Rebalancing Cost = $47. No trades are done inside the taxable account (SeeSaw1). Rebalancing a portfolio with more than one account is dramatically more difficult that a single-account portfolio. The potential cost savings can also be dramatic. The real world can get much more complicated, but BalancingAct takes it all in stride allowing a regular investor to make expert choices. See online documentation for in-depth details.